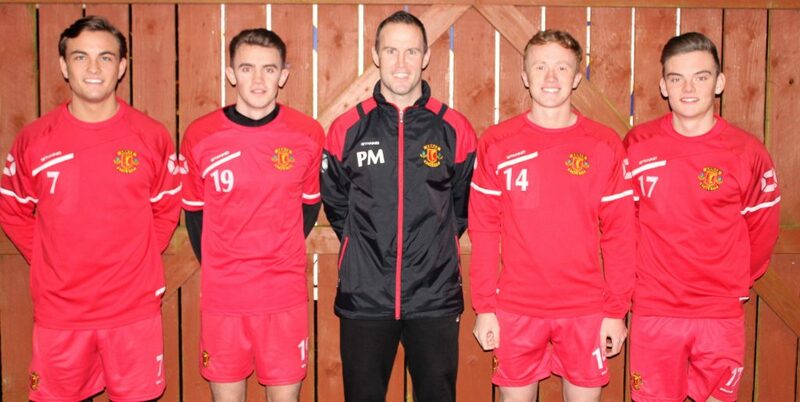 Manager Peter Murphy has made his first signings of the January transfer window, with 4 new additions to his Annan Athletic squad. Pictured left to right, Evan Horne, Jamie Henry, Peter Murphy, Conor O’Keefe, Ben Armour. Conor O’Keefe and Evan Horne have both signed on loan from St Mirren until the end of the season. O’Keefe is a 19 year old winger that plays with the development squad at St Mirren but has this season made the step up to the first team, making a hand full of appearances, most recently coming off the bench in a 2 nil win against Dundee United on 29th December. Horne is also 19 years old and plays centre midfield. Evan has been involved with Dunfermline and Dundee United before joining the Development team at St Mirren. Ben Armour joins on loan from Greenock Morton. The 19 year old striker was originally signed at Morton from Queens Park as a development player but made his debut for the first team last season against Dunfermline. He has since made another 8 first team appearances for the Championship side including 13 minutes in last weekends fixture. Jamie Henry has signed a deal at Galabank after leaving Arbroath. 20 year old Henry plays centre midfield but is very versatile and has also played in defence. Jamie came through the youth ranks at Aberdeen before signing on at Arbroath following a successful loan spell at Gayfield. All 4 players go into the squad for this weekends trip to Berwick.